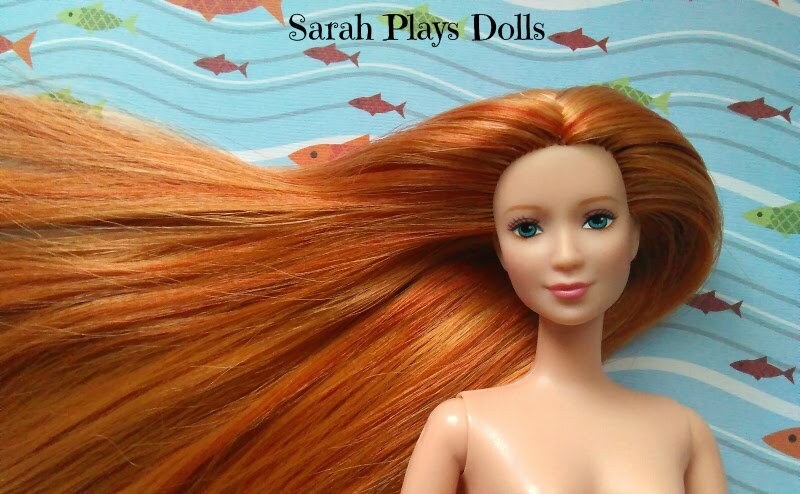 Sarah Plays Dolls! : Check out my rack! 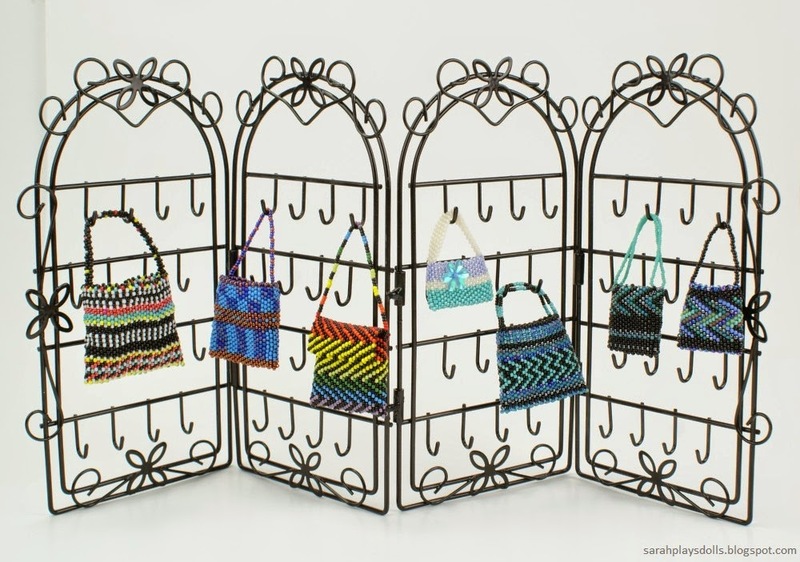 By which I mean, the rack for my beaded doll purses. I hope you're not too disappointed. 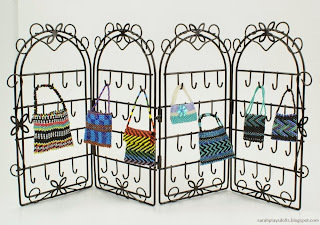 Dolly friends, we got the photo of the purse rack taken sooner than I thought. I helped prepare for the Idea Store jewelry sale again this year, and while I was setting up the earring table, something shiny caught my eye, the way it inevitably does. But this time, instead of beads (don't worry, I bought plenty of those, too) I saw this wire jewelry rack. I took one look at it, with all those tiny little hooks, and I knew that I had to have it. So the next day, when it was almost time for the sale to start, I asked my friend Carol, who is in charge of beads and jewelry, if I could have dibs on it. And because she is wonderful, she told me I could. So it quickly went into my pile... along with some cute stuffed bunnies I'd found. I'm not sure where I'll put my rack, but I do know that I plan to put plenty more on it. Beaded bracelets. More bags. Necklaces. The dolls are excited, and Melina and Mara, who have elected themselves as the Accessory Planning Committee, are full of suggestions. And by suggestions, I mean strongly-worded commands, because they obviously run the show around here. Did you notice the blue and purple striped bag? It's new. I'm proud of that one. As I type, I have another bag in the works. As usual, I'm going to do something different for it, but what that will translate to... remains a mystery. Maybe I'll use some of the chain I bought at the jewelry sale? I will have to ask The Bosses if they approve. Love your racks. That would really be good for hanging dolly's jewelry, hats or belts, as well!! !